People aren't always aware of your ignorance. Sometimes you have to advertise it. The weak usage of a comparison with Hitler or the Nazis to try to make a point, for lack of any real logic or debate skills. 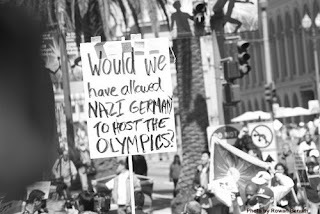 And, in this case, seeming unawareness that Nazi Germany actually did host the 1936 Olympics! Oh man, this is so sad but so funny.